VOICE CONTROL FOR YOUR CONVENIENCE: Set lighting levels with Alexa, Google Assistant for a convenient hands-free experience. Activated with the ’Smart Life’ skill in Alexa App. SMART DIMMING FROM ANYWHERE: Dim and control your lights from anywhere through your smartphone or tablet. This smart dimmer connects to your existing home Wi-Fi network to provide wireless remote control of your lights (no hub required). 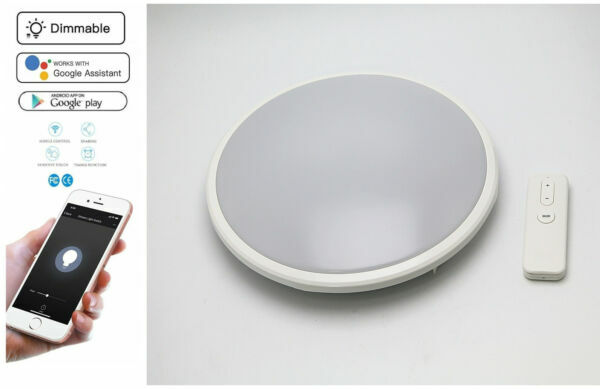 11" 18W ceiling light fixture, 3000K color temp, 50,000 Hours, Estimated energy cost per year $1.72. Requires a secured 2.4 GHz Wi-Fi network connection.